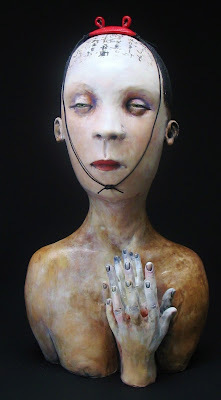 Legerdemain was juried into the ACGA@MAH exhibit currently running at the Museum of Art and History in Santa Cruz. Runs December 18, 2010–March 13, 2011 in Solari Gallery. When I dropped off this piece I got a glimpse of the other artwork....amazing work everywhere peeking out of boxes and bubble wrap. You wouldn't want to miss it. It is a fun day trip. The Boardwalk is nearby and good places to eat. See the Monarch butterflies at the nearby Natural Bridges State Park. And there's always the Mystery Spot.